"Ready for a new dystopian heroine to cheer for? 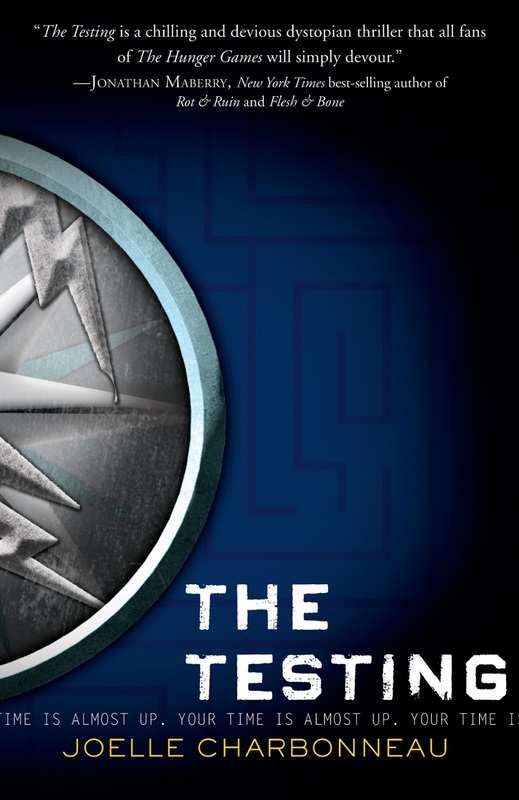 Then we suggest you check out Joelle Charbonneau's The Testing, the first in a new YA trilogy... An electrifying debut." "There is nothing standardized about this Testing. Charbonneau's imagination will surprise readers at every turn." "Perfect for fans of The Hunger Games." battle royale-esque novel, The Testing by Joelle Charbonneau which will be published by Houghton Mifflin on June 4th, 2013. They also sent me an email informing me that you can read a prequel and watch a trailer on the books website, the banner also links to the prequel. Already The Testing is being called a Hunger Games rip-off, and while it is true that The Testing, like Divergent before it, is derivative of the aforementioned book, it's not a rip-off. Unless you mean, Joelle Charbonneau's novel was in part inspired by, and is riding on the coattails of success that The Hunger Games has enjoyed, then yes, it might be called that. But many times derivative works can outshine the original one. I don't think Hunger Games was better than Battle Royale, but to dismiss a book on it's derivative value alone is to dismiss some of Studio Ghibli's best works, Castle in the Sky being derivative of Gulliver's Travels, Ponyo by the Sea being derivative of Wagner's Ring Cycle (however slight), and The Cat Returns being a derivative sequel of the studio's own, Whisper of the Heart. The Testing shares slight similarities with Divergent already, the graduation ceremony being an auspicious occasion. However, Malencia "Cia" Vale's narrative voice is much more stilted, more formal and awkward. I liked how in the Dust Lands series, Saba's speech is that of someone who has learned English away from books and most grammar, making sense for someone who lives so far away from civilization in a post-apocalyptic world. Here, Cia's speech makes sense if we imagine her world as one rebuilt to be better than the last one. Emphasis being on re-population and survival of humans. The prequel is short, from Cia's older brother Zeen's point of view. He's looking forward to being selected for the testing, and from my exposure to him in the book so far, I am hoping he will Go West, Young Man as they say. The prequel gives me hope that he will. As of yet, I don't have much more to say about The Testing. Whether it will outshine any of the YA post-apocalyptic novels that have come out in recent years, or just as well stand among them as something new and exciting, remains to be seen. All I know is people are going to die. Like students need more pressure, right?